When new drugs, or new ways of using existing drugs, emerge, often only limited information is available about the short- and long-term health effects of these drugs. It takes time to develop tests to detect these drugs and then to conduct research to determine if they are causing adverse health effects, even death. This page provides information about these emerging drugs and related concerns. 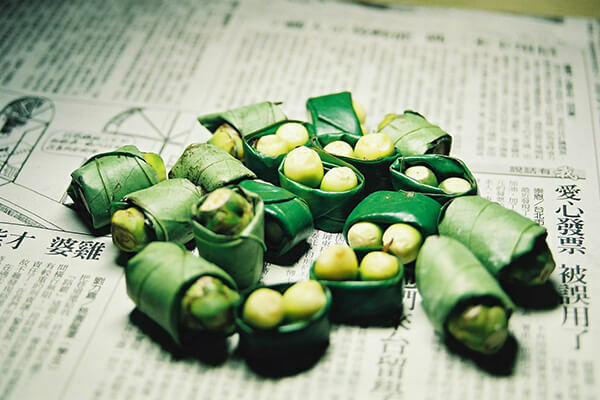 Betel quid usually includes a combination of the Areca nut (from the Areca catechu tree) and slaked lime (calcium hydroxide obtained by heating or harvesting sea shells or quarrying limestone) wrapped in a betel leaf. In some countries, when tobacco is added, the combination is called gutka; without tobacco, it’s called pan masala. Spices are also added in some cases for flavoring. It is the fourth most commonly self-administered psychoactive substance in the world after caffeine, alcohol, and tobacco and the most commonly used in Asia. It is estimated that more than 600 million people use betel quid worldwide. The areca nut contains arecoline, muscarine, and pilocarpine, which can have stimulant and relaxation effects. The International Agency for Cancer Research has classified betel quid as being cancerous with or without tobacco. Other health effects include risk of having a low-birth weight baby if consumed while pregnant. Although betel quid use disorder (BUD) is not formally identified as an addictive behavior, studies are looking at chronic use leading to myriad of health problems including oral health cancers. Read more in the Journal of the American Medical Association. Use of a dangerous synthetic cathinone drug called alpha-pyrrolidinopentiophenone (alpha-PVP), popularly known as "Flakka," is surging in Florida and is also being reported in other parts of the country, according to news reports. Alpha-PVP is chemically similar to other synthetic cathinone drugs popularly called "bath salts," and takes the form of a white or pink, foul-smelling crystal that can be eaten, snorted, injected, or vaporized in an e-cigarette or similar device. Vaporizing, which sends the drug very quickly into the bloodstream, may make it particularly easy to overdose. Like other drugs of this type, alpha-PVP can cause a condition called "excited delirium" that involves hyperstimulation, paranoia, and hallucinations that can lead to violent aggression and self-injury. The drug has been linked to deaths by suicide as well as heart attack. It can also dangerously raise body temperature and lead to kidney damage or kidney failure. The death of an Ohio high school senior caused by an overdose of powdered caffeine has prompted the FDA to issue a safety advisory about caffeine powders. Bulk bags of pure caffeine powder are readily available online, and these products may be attractive to young people looking for added caffeine stimulation or for help losing weight, but they are extremely dangerous. Just a teaspoon of pure caffeine powder is equivalent to about 25 cups of coffee—a lethal amount. Besides death, severe caffeine overdose can cause fast and erratic heartbeat, seizures, vomiting, diarrhea, and disorientation—symptoms much more extreme than those of drinking too much coffee or tea or consuming too many sodas or energy drinks. Although caffeine is generally safe at the dosages contained in popular beverages, caffeine powder is so potent that safe amounts cannot be measured with ordinary kitchen measuring tools, making it very easy to overdose on them even when users are aware of their potency. The FDA thus recommends that consumers avoid caffeine powder altogether, and wishes to alert parents to the existence of these products and their hazards. “Krokodil,” a toxic homemade opioid that has been used as a cheap heroin substitute in poor rural areas of Russia, has recently been featured in news reports alleging its appearance in parts of the United States. The CEWG is investigating, although the DEA has not yet confirmed any krokodil in this country. Krokodil is a synthetic form of a heroin-like drug called desomorphine that is made by combining codeine tablets with various toxic chemicals including lighter fluid and industrial cleaners. Desomorphine has a similar effect to heroin in the brain, although it is more powerful and has a shorter duration. Krokodil gets its name from the scaly, gray-green dead skin that forms at the site of an injection. The flesh destroyed by krokodil becomes gangrenous, and, in some cases, limb amputation has been necessary to save a user’s life. We will update this page with any further information on krokodil in the U.S., if cases are found. “N-bomb” refers to any of three closely related synthetic hallucinogens (25I-NBOMe, 25C-NBOMe, and 25B-NBOMe) that are being sold as legal substitutes for LSD or mescaline. Also called “legal acid,” “smiles,” or “25I,” they are generally found as powders, liquids, soaked into blotter paper (like LSD) or laced on something edible. These chemicals act on serotonin receptors in the brain, like other hallucinogens, but they are considerably more powerful even than LSD. Extremely small amounts can cause seizures, heart attack or arrested breathing, and death. At least 19 young people are reported to have died after taking 25I- 25C- or 25B-NBOMe between March 2012 and August 2013. People may ingest one of these drugs unknowingly, believing it to be LSD; a young man in one medical case report published in late 2014 experienced severe hallucinations and panic and attempted suicide after such an ingestion.